I was wondering when do you use 6 tbs of oil that listed under ingredients. I also see oil under tadka/popu. Typo! Have updated the recipe, Prarthana. Very nice pickle…i love to eat this pickle with dosa, rice,chapati and upma. We also prepare the same way..But lil different. Instead of sun drying toamto juice and tamarind, we boil on the stove for 30 mins on low flame about 4 days till it becomes very thick. After that we grind sun dried tomatoes into small pieces and add it to the liquid.. It is our pleasure if you could participate in our Sizzling Summer Contest.You could win one of the two $50 prizes. You can submit any summer themed recipe..
Hey Sailu, The tomato pachadi looks very tempting. But here in Hyd tomatoes are for Rs. 50/- per kg. I need to wait for the prices to drop …….And if I make I don’t make less than 4-5 Kgs. We all love pickles at home. Is it possible to buy sun dried tomatoes in Vizag or nearby towns ? As far as I know, it would be difficult to find sun dried tomatoes in any store in Vizag. 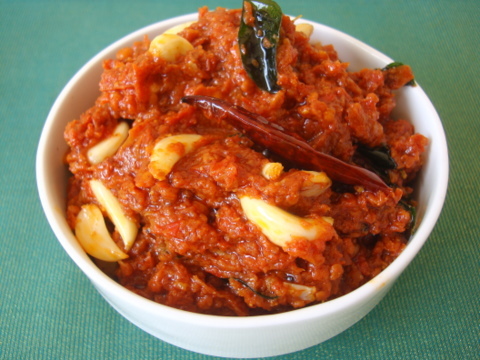 The sun-dried Tamato Pickle looks very attractive, it is a good accompanyment to variety of meals. I will surely try this one. Keep writing new recipes. Great work. Is there any way I can make this with sun dry tomatoes? I live in Melbourne and it is winter here now.Or could I dry the tomatoes in the oven? Any ideas? Thanks.And hey I love your recipes! I have blogged another tomato pickle that does not require the tomatoes to be sun-dried. Follow this tomato pickle recipe. This is awesome. We can skip all the hard work to make the sun dried tomatoes at home by buying them at the store. It will save our time too. Thanks for sharing you delightful dishes with all. Why don’t you open a store and sell the right tools like Gulabi puvvula mould etc. You can think more about new tool like Rechal Ray and Gadia. i wanted to know for sun drying tomatoes i got to keep them in the sun for how long? and will keeping them back evryevening not spoil them?should i refrigerate? It will take a few days to sun dry tomatoes. Every evening, put them back indoors and not refrigerate. It will take at least 7-9 days to completely sun dry. Can i omit the garlic part and continue with the process? Yes. You can add inguva/hing instead. instead of sun drying the tomatoes daily would it be quicker if you placed the tomatoe pieces on a reflective sheet and keep them in the oven at say 150 degrees.I was once doing an italian dish and did it this way.Came out ok.But i dont know, your method may be tastier! Can I use Tamarind concentrate instead of Tamarind? If yes, in what quantity? I am not really sure since I have not used store bought tamarind concentrate. I’d go with a heaped tablesoon of concentrate. Hi sailu, Im in paris and dont have lot of sun but we have ready made sun dried tomatoes available. but what do i do for the sauce .? any suggestions please ?? I love sn dried tomatoes. i checkd the other recipe too. but i would love if u can suggest me to use the ready made sun dried tomatoes. thanks…. If you do not have a lot of sun around, I’d suggest you go with the instant tomato pickle. Just using store bought sun dried tomatoes without the sundried tomato liquid, will not work for the above recipe. I am trying your recipe for the sundries pickle. Currently tomatoes have dried nicely and as u said, the tomato and tamarind liquid has started thickening, however it has also started fermenting. Can u please advise if this is how it is supposed to be. The liquid is thickening and souring at the same time. Yes, that is how its supposed to be. How to know that the liquid is done. I have been keeping it for 5 days in sunlight but can’t decide if it’s done or not. The tomato pieces have dried very nicely but can’t decide on this one. Plz help.